The process of finding these keywords is called Keyword Research. After reading this article you’ll be able to do Keyword Research on your own. Keyword Research is the first step in incorporating the right keywords in your website. The second step is connecting the keywords you’ve found to the right pages within your website. That results in your Keyword Strategy, which will be covered in another article. Before we dive into the technicalities around Keyword Research, let’s first get our terminology straight. A search query, or query for short, consists of one or more keywords which are typed into a search engine. Keywords are incorporated in your content. You can incorporate one or more keywords. For the sake of ease, when I refer to ‘keyword’ I mean one or more keywords. To make explaining the Keyword Research process easier, let’s assume you’re running an eCommerce platform selling high-end TVs. Business is OK, but you want to double your revenue within a year. Boosting the organic traffic to your website plays a key role in this. What keywords should you be found for? Who’s your target audience really? Write down all of the keywords that your website should be found for. Keep the keywords generic in nature, further down the process you’ll dig deeper into very specific keywords. Write down your USPs - what convinces customers to choose you over your competitors? This tells you a lot about your target audience (see below) and the USPs are important to incorporate in the Keyword Strategy. Who’s your target audience really? Describe them using imaginary people, so called “personas”. Things to cover are: age, profession, goals in life, wealth, what drives her in making a purchase or choosing for a service etc. Write down who your competitors are. Make a simple list. Now go back to the keywords that you’ve written down at the beginning of this step, and type them in in your prefered search engine. See what websites come up. Use these websites to complement the list of competitors. In my experience, you rarely see the exact same companies popping up as the ones that you initially wrote down. Use Google Search Console or Bing Webmaster Tools to find out what keywords you are currently already found for in the organic search results. Google Search Console, previously known as Google Webmaster Tools, is an application Google uses to give feedback on and communicate about websites to website owners. If you’re doing SEO and Google plays an important role in your market, it’s essential you use Google Search Console. Click the ‘Download’ button on the bottom left. Bing Webmaster Tools is Bing’s equivalent of Google Search Console. It’s used by Bing to give feedback on and communicate about websites to website owners. If Bing plays a (big) role in your market, it’s essential you use Bing Webmaster Tools as well. Click the ‘EXPORT’ button on the top left. SEMrush is an online marketing research suite for analyzing your competition's online presence. Using SEMrush you can find out what keywords they are found for, on what position and what keywords they advertise for. SEMrush calculates a so called visibility. The visibility is a metric explaining how dominant a website’s online presence is. Click the ‘Export’ button on the right side, underneath the visibility graph. Even though SEMrush is a paid tool, they offer some data for free and they also offer a free trial. If you already have active paid search campaigns for Google and/or Bing be sure to use this data. This is valuable data because this gives insight into what keywords work for your business, what keyword variations people use and so on. Configure this report to show the keyword data from ‘All time’ using the datepicker on the top right. Make sure the report includes CTR and conversion data. The text people use to link to a page is a strong signal for users and search engines what the page is about. We call the text which is linked anchor text. In the example link below the anchor text is ‘Content Monitoring Service’. Research what anchor text people are using when linking to your website using Google Search Console, Bing Webmaster Tools, and third party applications which offer link information such as Majestic.com or Ahrefs.com. Each service uses its own techniques for finding link information, so the information each service offers is different. In order to get a full picture, it’s important to combine several resources. Click the ‘Download this table’ button on the bottom left. Go to ‘Reports & Data’ > ‘Inbound Links’. Click the ‘EXPORT ALL’ button under the graph. Majestic is a service which offers information on how websites are linked. For each website Majestic knows about, they provide what pages websites are linked from, what anchor text was used and so on. Click on the ‘Export data’ button at the bottom right of the wordcloud. Even though Majestic is a paid tool, they offer some data for free and they also offer a free trial. Ahrefs is a competitor of Majestic, also offering information on how websites are linked. Click on the ‘Export’ button at right hand side, above the table. Even though Ahrefs is a paid tool, they offer some data for free and they also offer a trial which costs $ 7. If you have search functionality on your website, you should be keeping track of what queries your visitors are using. You can easily pass this information on to Google Analytics using Site Search. Sometimes there are real gems in there. You may not realize it, but analyzing your competitors websites is a great way of finding interesting keywords. Use the list of competitors you wrote down in step 1. For each of your competitors you can run an analysis on the keywords they are visible for in the organic and paid results in Google, as well as the anchor texts used in the links to their websites. What works for them, may also work for you. Additionally, run an analysis on the anchor text used for the links to your competitor’s website. Follow the steps as discussed above in Majestic and Ahrefs. Export all of the data. By now you have identified some great keywords for your website. 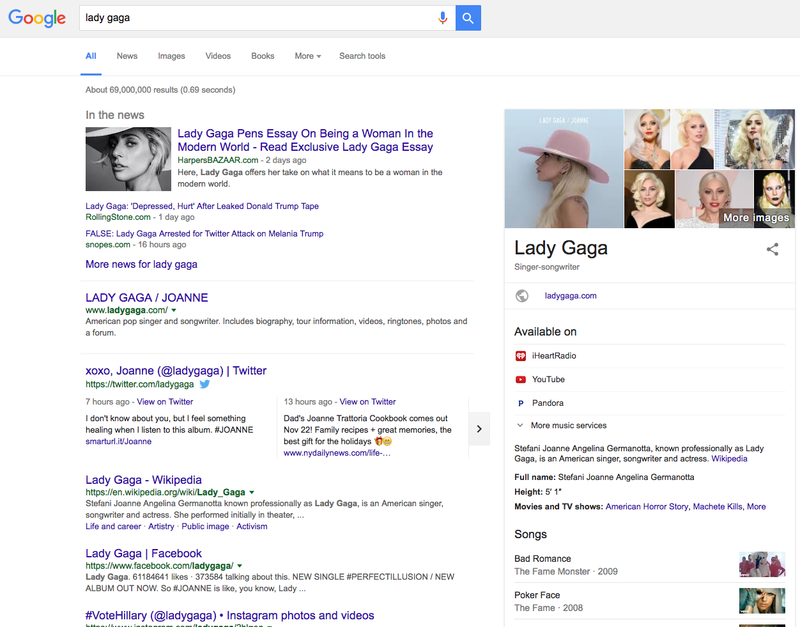 Start filling them in in Google and Bing and see what keyword suggestions they give you. Write down anything good. Google’s platform for managing advertisements is called Google AdWords. A popular Google AdWords feature used by people doing Keyword Research for getting suggestions is Google AdWords Keyword Planner. Use Google AdWords Keyword Planner to get keyword suggestions. Fill in some of the keywords that you’ve found to be promising and configure the targeting so it aligned with your target audience. Add keywords that sound promising to your ‘plan’ so you can export them easily later on. Once you’re done, export all the keywords in the plan using the ‘Download button’ under the graph. Step 2 and 3 resulted in two large lists of keywords. There’s bound to duplicate amongst them, so the first step is merging them, removing duplicate and removing any keywords that don’t make sense. After that you categorize the keywords so the keyword set becomes manageable. During this phase of Keyword Research the first shapes of your Keyword Strategy (what keywords should be mapped to what pages) will become clear. The Keyword Strategy will be covered in another article. Use Microsoft Excel, Open Office or Google Spreadsheets to add all of the keywords you’ve gathered in the previous two steps to one spreadsheet. Make sure you keep the source of each keyword in a separate column. Later on this can prove useful when you choose which keywords to incorporate in your website during the Keyword Strategy phase. Also, add column headings and freeze the first row to be able to keep good overview of your data, and to easily sort based on the column headings. This is already useful in this stage, but it becomes even more useful when we add more columns to the spreadsheet. Remove all duplicate keywords. In Microsoft Excel there’s a function for this under ‘Data’ > ‘Remove Duplicates’. For Open Office there’s a neat little workaround, and the same goes for Google Spreadsheets. Go through your keyword set and remove keywords that don’t make sense for you to target: those referring to your competitors and keywords that don’t match your target audience. The outcome of “Step 1: Brainstorm” is a very useful point of reference for this. For example, the keywords ‘amazon samsung led tv’, ‘best buy samsung led tv’ are competitors of yours. The keywords are branded searches for those competitors, so it doesn’t make sense for you to target them. Chances of actually selling something to them are slim, unless you have a significant edge over them. Someone searches for ‘cheap samsung led tv’ is looking for a cheap TV. Since you’re in the business of selling high-end TVs, this keywords isn’t likely used by your intended target audience. Now your keyword set is free of duplicates and useless keywords. The next step is to categorize all keywords. You don’t need the column ‘Source’ for that, so you can hide it for now (don’t delete it!). Start the categorization process with sorting the keywords alphabetically. This enables you to make a lot of headway quickly. When dealing with large keyword sets, split categories up into multiple levels of subcategories. 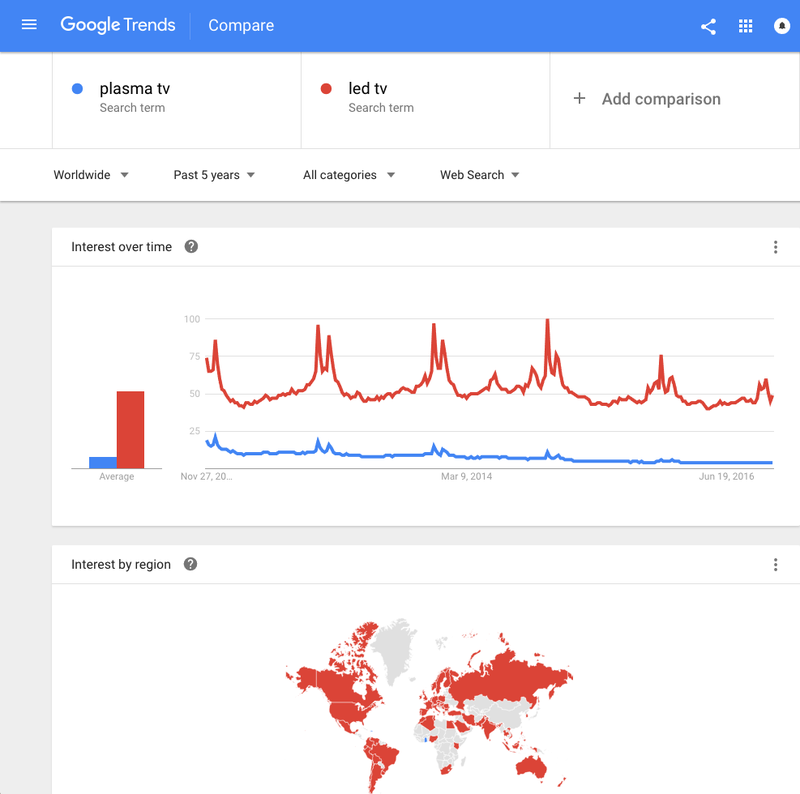 The monthly search volume of a keyword is the amount of searches for that keyword within a timespan of one month. Not all keywords were created equal, some may only get 50 searches a month while others get hundreds of thousands of searches a month. The difficulty score of a keyword shows you the level of competition you have to deal with. Tools such as SEMrush calculate this difficulty score for you. Both the search volume and the difficulty score of a keyword can be found in SEMrush. Keep in mind, often people want to target keywords that have a high monthly search volume, but usually this comes at a price: high competition. Also, for some keywords which have low search volume tools such as SEMrush won’t have any information. 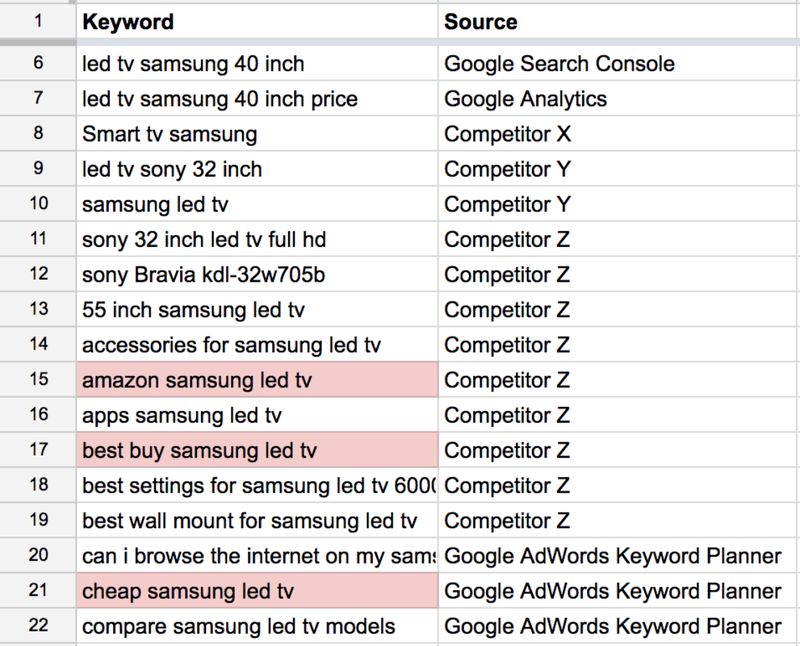 That doesn’t mean those keywords are useless, even though they have low search volume they may have an enormous business value (example: ‘led tv samsung 40 inch price’). Fill in the keywords you want the search volume for. Click the export button under the table, on the bottom right. Fill in some of the keywords that you want the search volume for and configure the targeting for your market. Click the ‘Get search volume’ button. Google AdWords Keyword Planner does show you the level of competition for keywords, but this is the competition for paid listings. If there’s no data on the difficulty of a keyword in SEMrush, then you can use the competition in Google AdWords Keyword Planner as a potential indication of the competition. Starting August 2016, Google AdWords Keyword Planner is only giving out search volume ranges if you don’t spend enough money in Google AdWords. Google AdWords Keyword Planner is returning the same search volumes for close variants (keywords that are very similar according to Google). For each keyword you need to determine the business value. 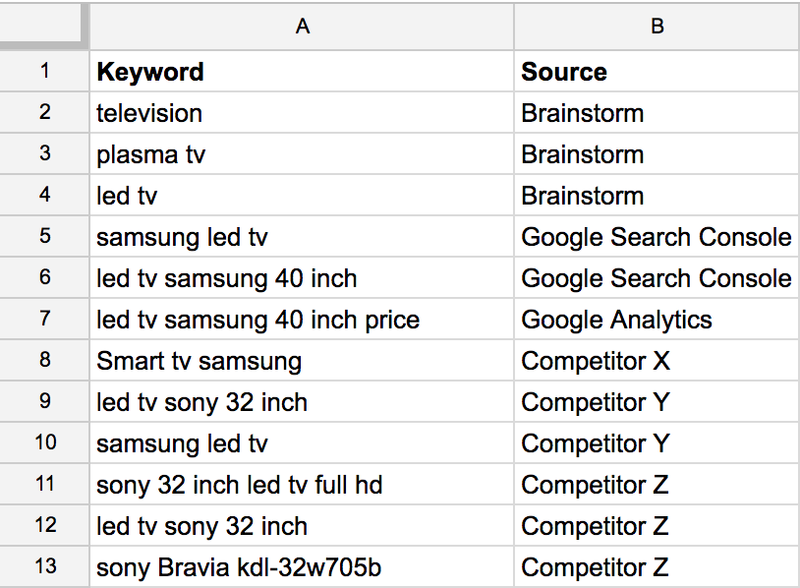 Compare for example the keywords ‘television’ and ‘led tv samsung 40 inch price’: what searcher is most likely to buy a TV from you? Business sense aside, perhaps you also have data on the conversion rate of keywords. For instance from your existing SEO and Google AdWords campaigns. This is great input for determining the business value of keywords. Before you start digging into what the search results look like for your keywords, take a break for a minute. By now, you’ll have found some keywords that are simply not interesting to you. For instance, high keyword difficulty but low business value or low search volume and low business value. Or perhaps you’ve found thousands of keywords which have high search volumes and you need to choose a cut-off point to preserve your sanity. Since adding what the search results look like is quite time consuming, take a moment to filter out keywords that you’re not going to use anyway to save time in the next step. Search engines try to understand search queries and return the best possible answers. Often these include advertisements, Map listings, videos, images, Wikipedia pages, Knowledge Graph results, Social Media accounts and so on. If you were thinking about targeting these keywords: I’d advise against it, find a different query which has less competition. Sometimes the search result pages is even shorter than usual. It’s vital to understand what you’re up against when choosing keywords to incorporate in your pages. Pick your battles. And choose the right content type for your battles. Are you seeing lots of videos in the search results for a certain query? Then it makes sense to consider ranking for that query using a video as well. In this step you should find keywords which look promising, while keeping in mind the keyword properties defined in step 4. Search for interesting combinations for these keywords. Usually you discover a lot of keywords with a low to moderate monthly search volume. All of these keywords combined make up for a high search volume, comparable in volume to a few generic keywords which have a high individual search volume. 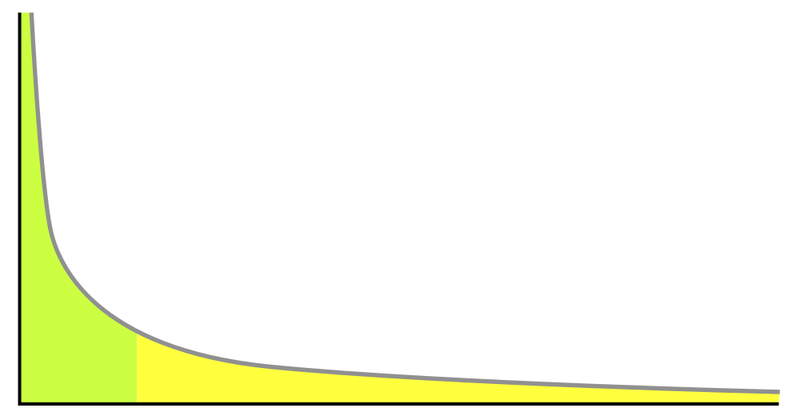 We call this the long tail principle. Say you’re selling over 400 different TVs, and let’s assume storage is not an issue and effectively doesn’t cost anything. The 20 most popular TVs make up for 50% of your revenue, while on the same hand you have 380 TVs which make up for the other 50% of the revenue. These 380 TVs are less popular individually, but all these 380 TVs combined bring in the same amount of revenue as the most popular 20 TVs. In this example the 380 TVs are the long tail. In the illustration below the green area is the 20 most popular TVs, and the yellow area is the other 380 TVs. Requires checking manually: you need to enter keywords manually and you can’t export interesting keywords. Supports checking bulk: you need to give input manually, but then the tool provides keywords in bulk. Repeat part of Step 4: remove duplicates, remove useless keywords and categorize. Repeat Step 5: retrieve information on attractiveness of keywords. You’re all set for the next phase: the Keyword Strategy. In the Keyword Strategy you’re going to map keywords to pages. You’ll probably find that you’ve found more keywords than you can map to pages. This means you have work to do: create more content and add more products! Let ContentKing monitor your website for issues and changes, while you focus on keyword research!